Tigris Dev Team, led by jailbreak tweak developer @Antique_Dev, is currently working on an iOS 11 jailbreak that will work on all 64-bit devices running iOS 11 firmware. Provided the exploits for this iOS 11 jailbreak remain functional, Tigris Dev Team will also port the JB to iOS 10.3.x. The iOS 11 jailbreak will be stable and semi-untethered. At the moment, Antique has gathered a sizable team that includes BallisticDiamond, coolfool245 and NickiLolzz on Reddit, as well as a few others. As of now they have iPod Touch 6G – iPhone 6, but the iOS 11 jailbreak will eventually support all 64-bit devices from iPhone 5S up to iPhone 7 and iPhone 7 Plus running iOS 11. The name for the iOS 11 jailbreak comes from Apple’s codename for iOS 11 firmware: TigrisSeed. The jailbreak itself doesn’t appear to be based on a 0-day exploit like the one Pangu demoed a while ago at the Janus security conference, but sources seem absolutely certain that this jailbreak will be released to the public, and that it will be semi-untethered, stable and free for the jailbreak community. Antique Dev already releases his Cydia tweaks free of cost. There’s finally some serious movement on the jailbreak scene once again. In earlier articles, we spoke about how we were confident that a new wave of developers would step up to the plate and make up for the huge gap that former jailbreakers have left. It looks like our words are proving prophetic. iOS 10 Jailbreak Attempts Now Have Free Rein, Will Todesco or Pangu Follow Through? 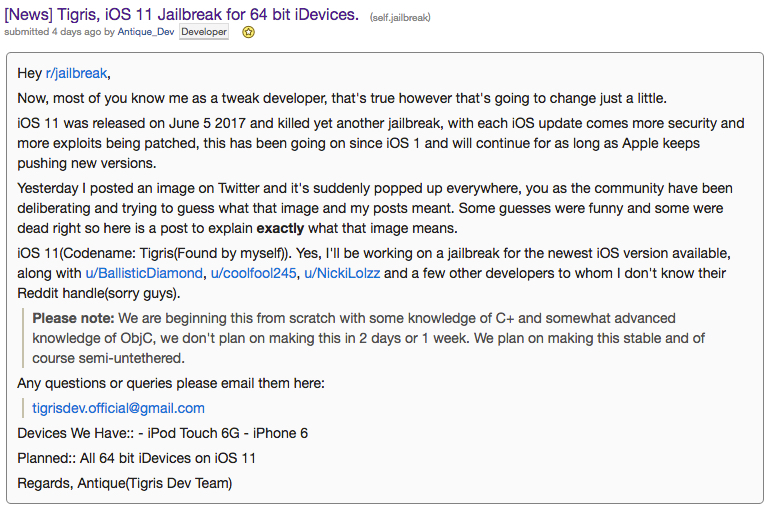 The iOS 11 jailbreak from Tigris Dev Team is current a work in progress, and it could be a while before it is actually released to the public. But it’s great to know that there are now two possible jailbreaks coming for iOS 11. The first was the one that KeenLab’s Liang Chen demoed at MOSEC 2017 a couple of weeks ago. We don’t know if that will ever be released, but we live in hope. Now, this new iOS 11 jailbreak is almost guaranteed to be released alongside iOS 11 in a couple of months. Antique has authored several Cydia tweaks, several of which have been pushed to GitHub to encourage other developers to explore their own options. You can see a full list of Antique’s open source tweaks here.